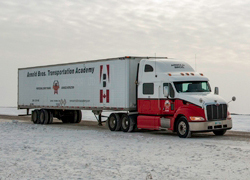 Arnold Bros. Transportation Academy is much more than a driving school. It is an educational institution built around a desire to see people within the highway transport industry be the best they can be with the best in skills to build their careers. Arnold Bros. Transport Ltd. was founded as a family business in 1958. After decades of growth and evolution, the company is now a leading North American carrier. A key factor in this growth has been the corporate commitment to continuous education of its team. Arnold Bros Transportation Academy arose from a growing recognition that the industry has a need for ever better trained staff. Our students in the programs we offer are a diverse group of individuals from many different backgrounds. Their goals and dreams are very much unique. What these people share is a commitment to excellence. They have committed to their personal success by embracing the process of improving their skills. Past participants in our programs and initiatives have been assisted in success in a dynamic career environment with the skills and abilities they have acquired. The instructing and support staff at Arnold Bros. Transportation Academy brings a broad diversity of industry and educational experience. The instructors have a track record of success in developing and delivering quality instruction and coaching to students. Most of all, they bring a passion for excellence. We believe that it is not enough merely to present information. We feel that we are not successful unless our students are successful. Our students aren’t successful unless they leave with new knowledge along with a sense of the need to take responsibility for continuing the learning process for ongoing success. The equipment used at the Academy has been selected with the students’ interests foremost. The tractors are newer and are all highway sleeper cab units. They are rigorously maintained to current provincial safety standards. The classroom presentation equipment is designed to allow us to take full advantage of all presentation techniques and media. As the industry continues to grow and evolve, there will be a constant need for individuals prepared to meet these challenges. Technology is changing and increasingly visible in every aspect of the industry. Customers have ever more exacting requirements, and the need for trained professionals has never been greater. The highway transport industry has experienced steady growth over the last decade. Increasingly, shippers rely on the transport companies of the nation to move goods across towns, provinces, the country and the continent. Commodities from gravel, grain, lumber, and pulpwood, to foodstuffs and fuel move every day in trucks and trailers. The increasing traffic between the U.S. and Canada along with the reemergence of Winnipeg as a transportation hub makes this city one of the most exciting places to be for those building a career in the highway transportation industry. As the city grows in importance along with the growth of the industry itself, we are preparing for an exciting period of opportunity. Our Academy staff share one common quality. They each have a commitment to seeing people develop themselves to the best of their ability. Our skilled and trained staff knows that the right education and preparation are the keys to career success.